When a standard square tube won't work, try a Cleartec Rectangular Tube! Our new Rectangular clear plastic tubes are an excellent addition to our standard product line. For times when standard square tubes won't work, they provide for an outstanding look on a retail shelf while maintaining ample product protection. 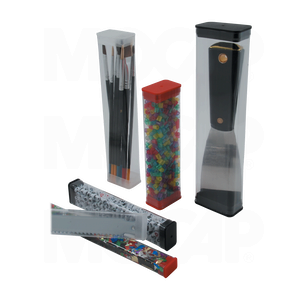 Our clear plastic rectangular tubes are also available as a Sealed Bottom Clear Plastic Rectangular Tube where a clear bottom is permanently adhered into the tube. Stocked in 4 foot lengths and sold in box quantities.